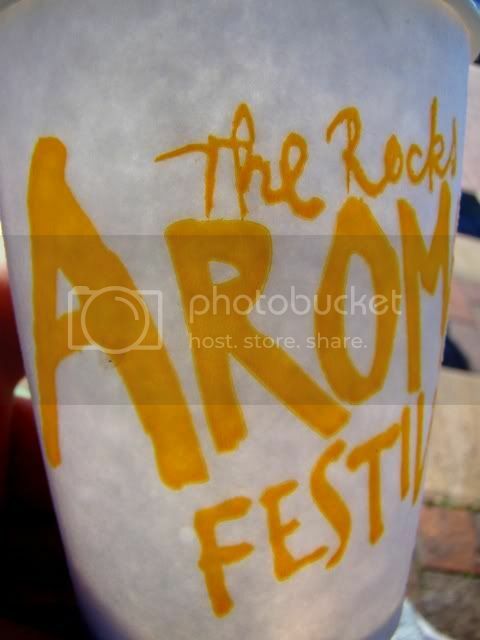 I have to admit, I'm a The Rocks Aroma Festival (henceforth 'TRAF') virgin. Well, not exactly a virgin, depends on how you look at it - let's just say that I went to 'second base' *wink wink* with TRAF last year. Okay. That's confusing - and rather disgusting. 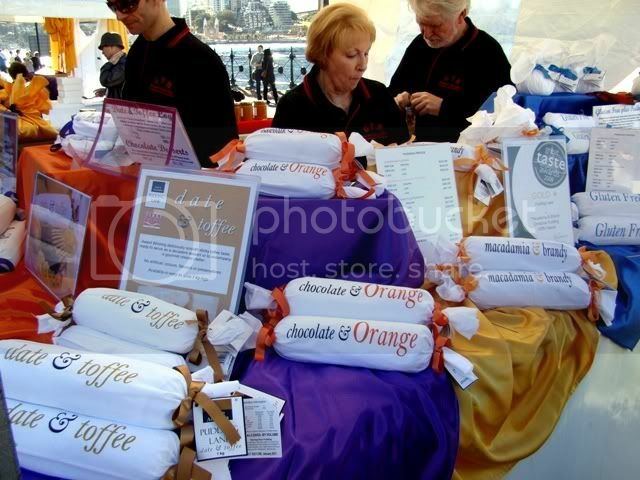 Anyway, last year, I didn't explore this fantastic festival thoroughly - just a sip of hot chocolate bought around the starting area of the festival. This year, I think it might be fun to explore and exploit around a bit. A wee bit of warning before ye proceed, though - this post is image-intensive. 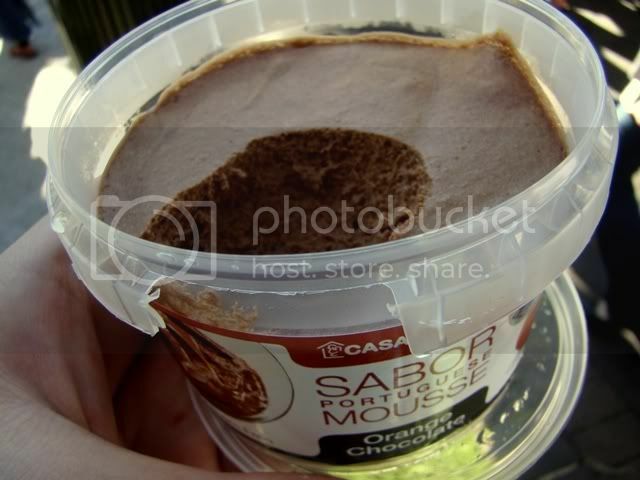 Probably the most images in a post in eatlikeacow history. But regardless, you have to see it all because taking these photos (plus editing, tweaking, and arranging them) was pretty laborious indeed! 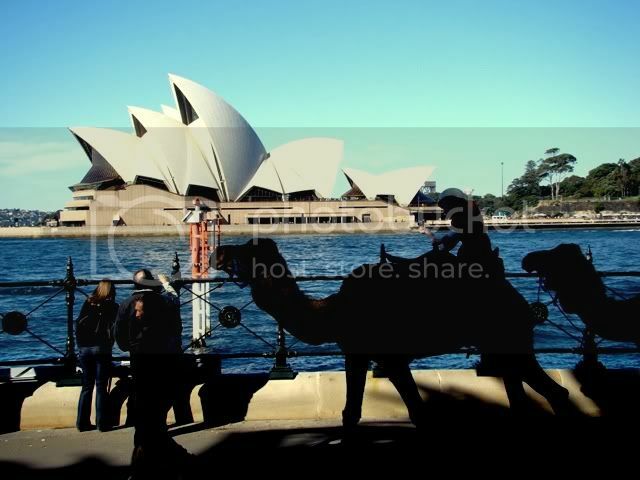 FYI, these photos are the result of selection from almost 400 photos I took yesterday. I know to most experienced bloggers and photographers this number is nothing (NOTHING! ), but for me, it's a freaking nightmare. 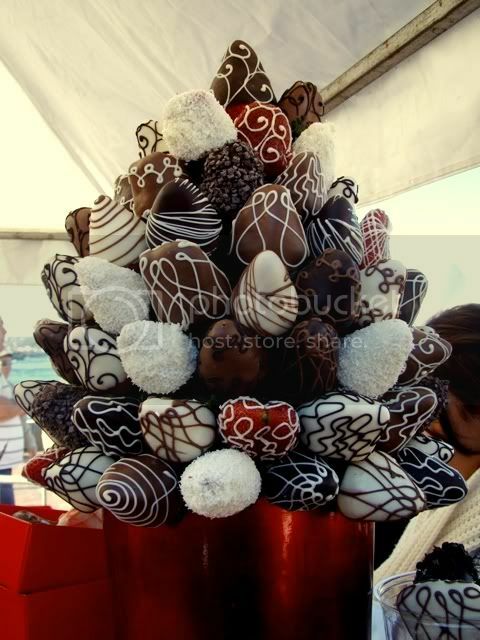 So, do enjoy! Let's get to it, shall we. 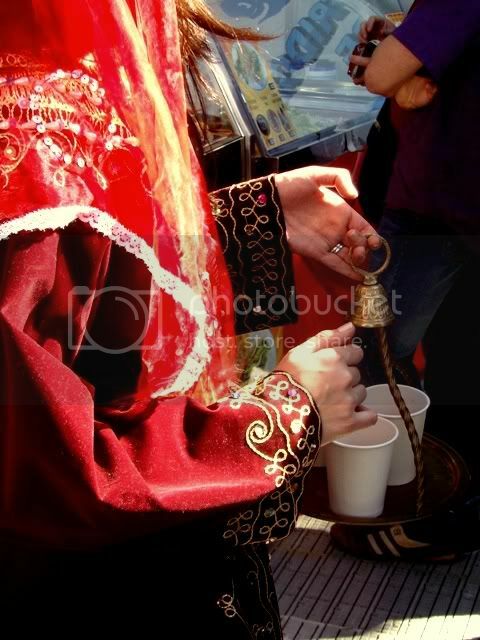 Basic thing about TRAF for you foreigners and aliens joining us tonight: TRAF is a food festival dedicated to, well, aroma - more specifically, aromatic drinks and desserts such as coffee-based, chocolate-based, and tea-based products (yum yum). 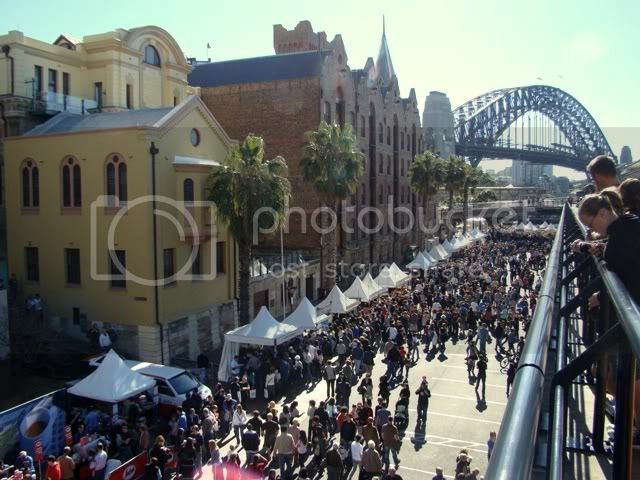 The festival occupied most part of the touristy strip of Circular Quay from The Museum of Contemporary Art, stretching to the area around the Overseas Passenger Terminal, Campbells Cove, until the roundabout somewhere near / after the Park Hyatt. 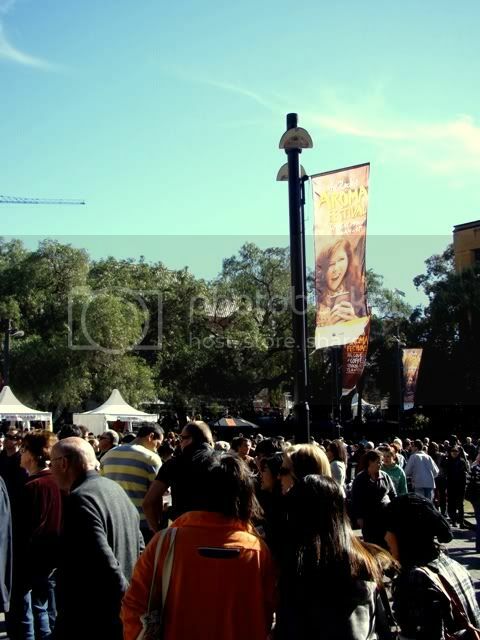 The festival is cleverly divided into four different "land" a la Disneyland-The Magic Kingdom kind of thing. Each "land" represents a geographical (and cultural) area of the world, namely: The Latin Quarter, The Continent, The Orient, and The Oasis. 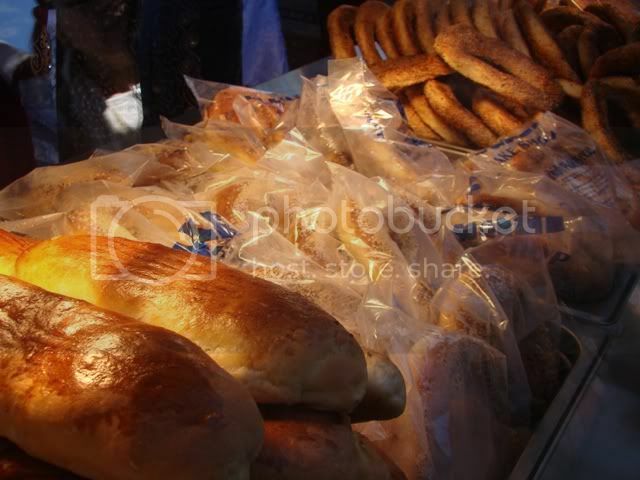 Supposedly, each land contains stalls which offers food items pertaining to its name. E.g. 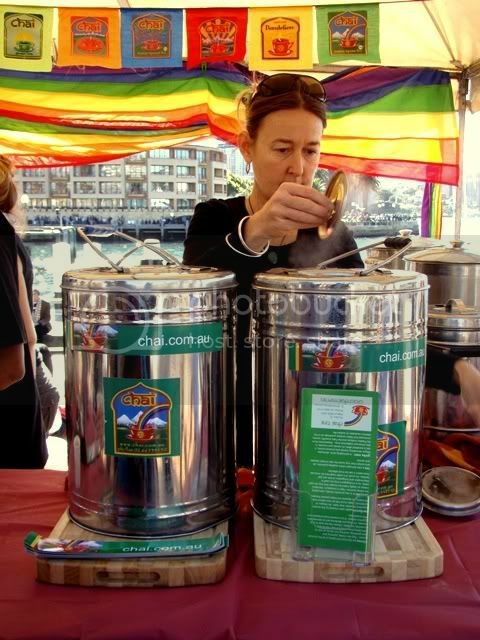 The Orient district should contain stalls that sells Chinese teas, Japanese teas, etc. However, there are lots of irregularities everywhere. E.g. 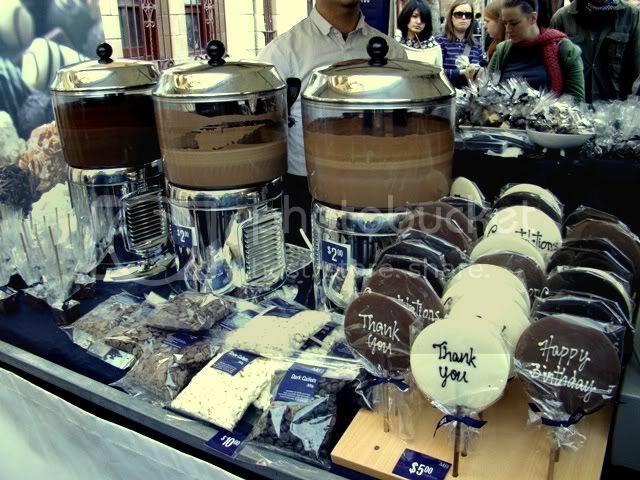 chocolate fudge stall located in The Orient district, etc. It's very annoying. Well, it's nothing big, really - it's just that the purpose of creating these "lands" are to make sure that visitors get the sensation of being whisked away from one continent to the other (again, a la Disneyland - God, I miss that place), and when they misplace stalls here and there, the sensation is just not there anymore. Anyhoo, let's grab our boarding pass and hop into the plane, 'cause the tour is about to start! Erique's catchphrase: "¿Donde Esta la Biblioteca?" 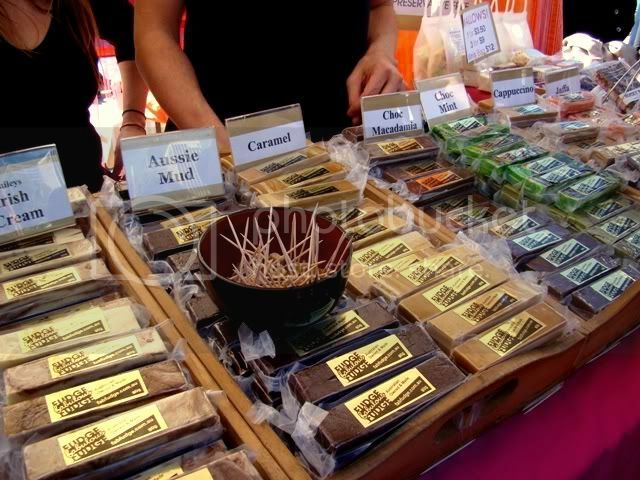 -> Various chocolate Tejas from Tejas Del Solar. 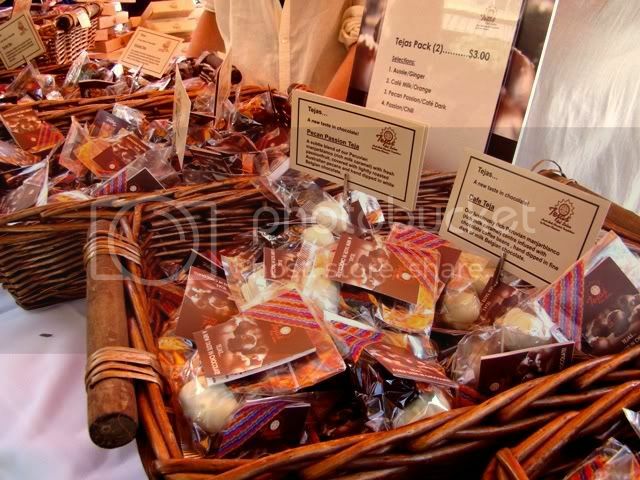 This Peruvian confectionery is made from chocolates filled with dulce de leche and nuts. Gotta love Tejas. 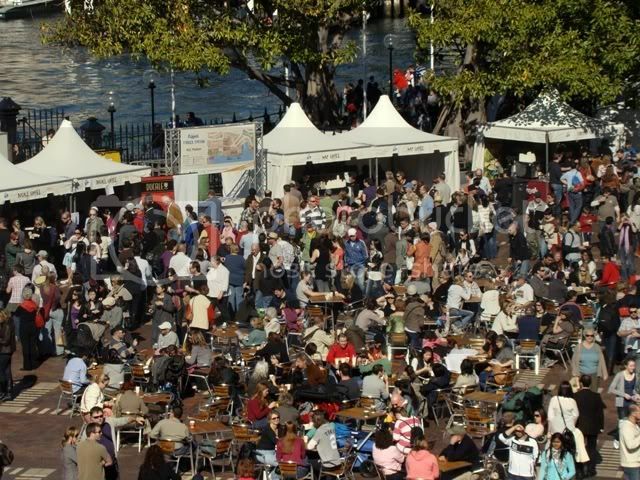 -> The entertainment in The Latin Quarter. Each "land" has its own stage and performers, which I think is a brilliant idea. 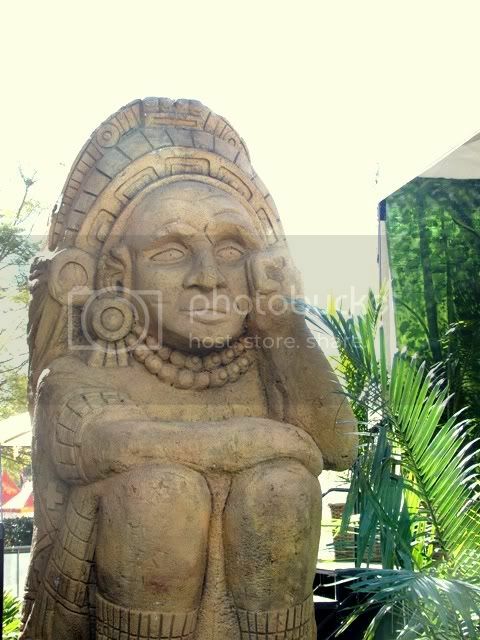 -> Authentic, ancient Mayan statue believed to grant the person who touches it fertility and potency. Nah, I'm kidding. I don't even know if this is Inca, Mayan, or Aztec (but I know tha it's made of an ancient, sacred substance known as Styrofoam). 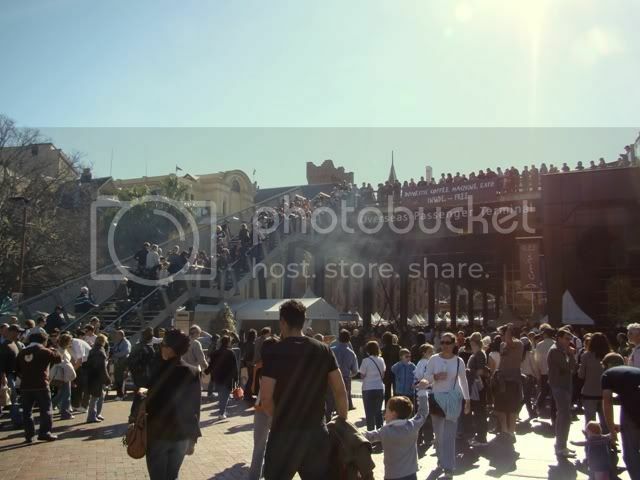 -> Crowd shot in the Latin Quarter. 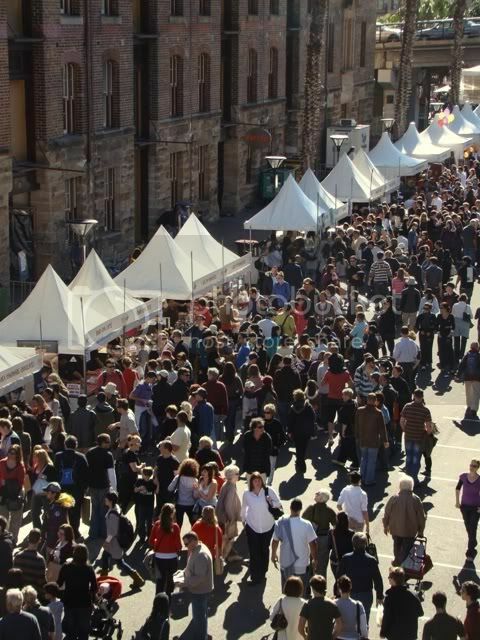 The festival started at 10 am and this photo was taken around 10.30 and look at all those people crowding the place already! I'm not a very outdoorsy person (okay, I lied. I hate the outdoors) and seeing these enthusiastic crowd enjoying the wonderful world of outside really makes me crave the air-conditioned, shady paradise that is my bedroom. (Sorry to be such a spoilsport)! 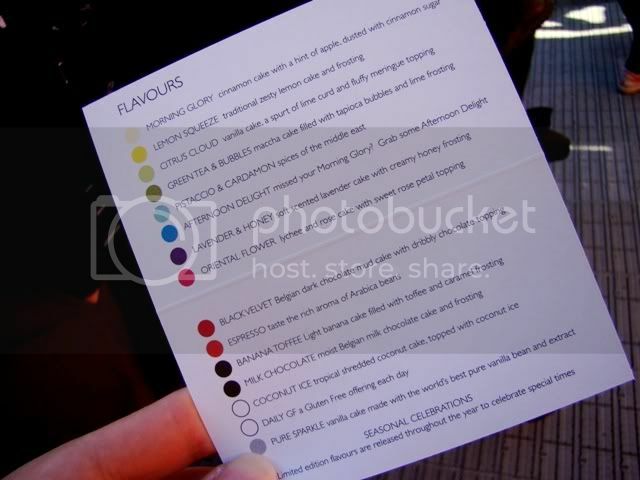 -> The Sparkle Cupcakery menu + color scheme. Wow. 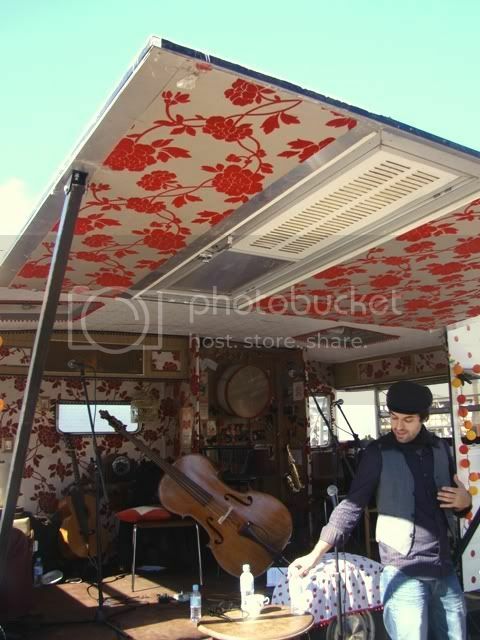 Erique's catchphrase: "hor auf, so laut in dieser nervigen sprache zu reden"
-> The entertainment: a ragtag-ish, random-looking music performers housed in a caravan. How wonderfully kitschy (yet predictable). I just LOVE the Florence Broadhurst-y wallpapers! -> Ta-dah! 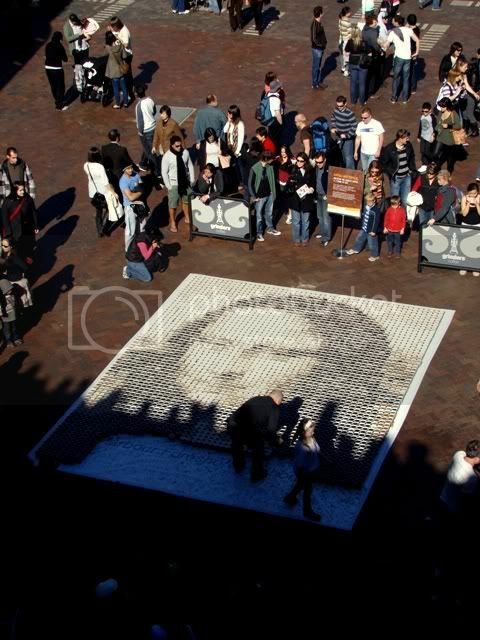 Behold, Da Vinci's Mona Lisa constructed entirely from various shades of coffee in cups. I don't know if they did this (or something similar) last year, but I just can't get over how fascinating the people who created this thing are! I don't know how they do it. They don't seem to have any sort of guide etched on the floor. And notice that little girl? YES, she's doing it too! She's actually contributing to the whole effort and she always places the cups in the right positions! I mean, wow! -> Okay - show-off shot. 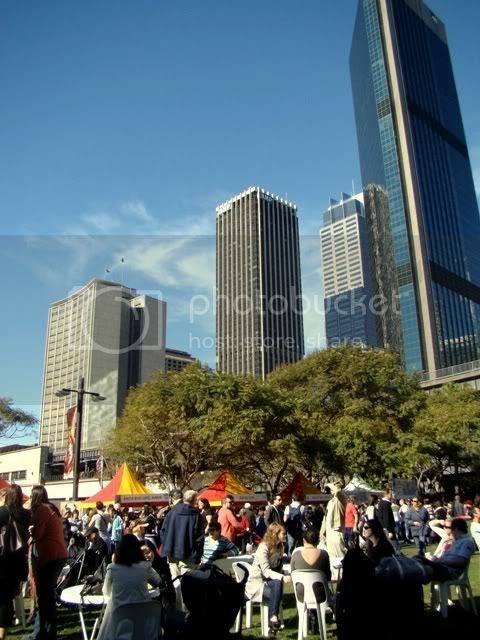 The skyline, the crowd, and the coffee-cup Mona Lisa. Totally Flickr-worthy. 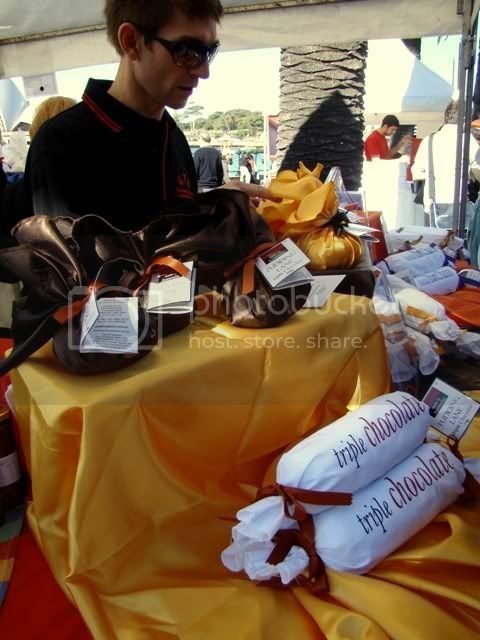 -> Mouthwatering chocolate drinks and chocolate stuff molded in various forms from I Love My Chocolates. -> Yet ANOTHER crowd-shot. 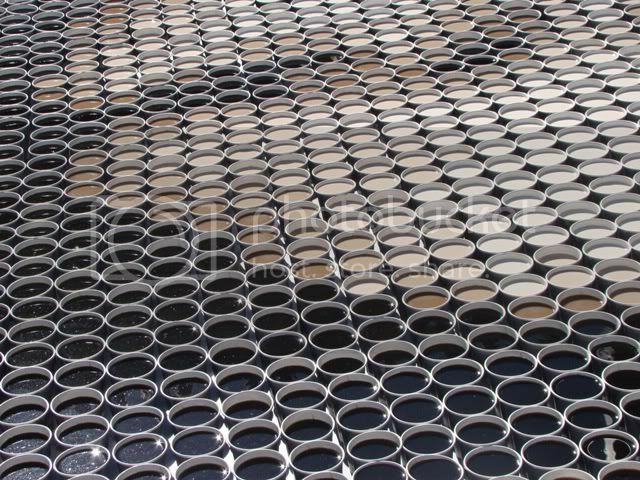 If you squint, it somehow looks like a haphazardly-structured bier garden somewhere in Vienna or Hanover. 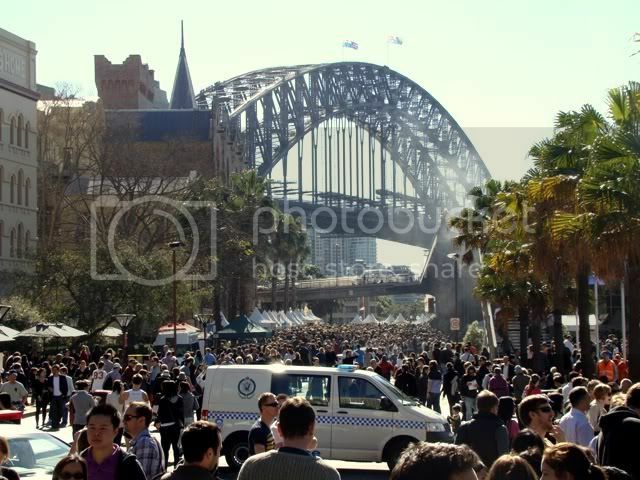 -> Oh my Lord, not another crowd shot. 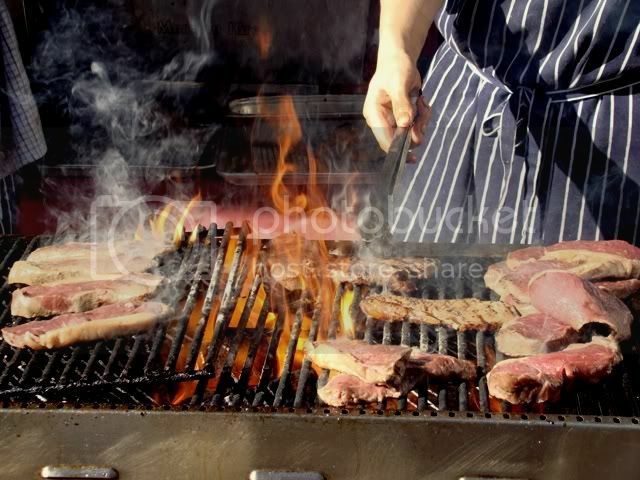 -> *Said in the style of 30 Rock's NBC page Kenneth Parcell* Hey, look everybody, it's Pony Dining's awesome chef, Damian Heads whipping up his famous Argentinean-style woodfire-grilled treats! Hi, Damian! 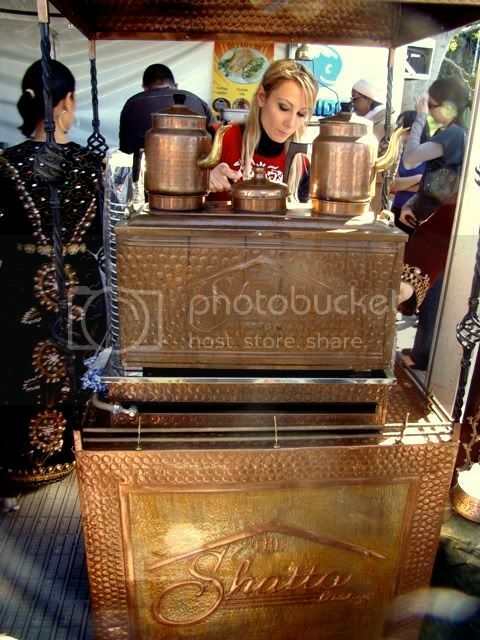 -> Hands down, the most fragrant and aromatic non-chocolate / coffee / tea stall in the whole festival. I heart Pony Dining! -> Whoops. Can't miss this shot. I love The Rocks. Never get enough of The Rocks. It is one of the prettiest places in the world, IMO. 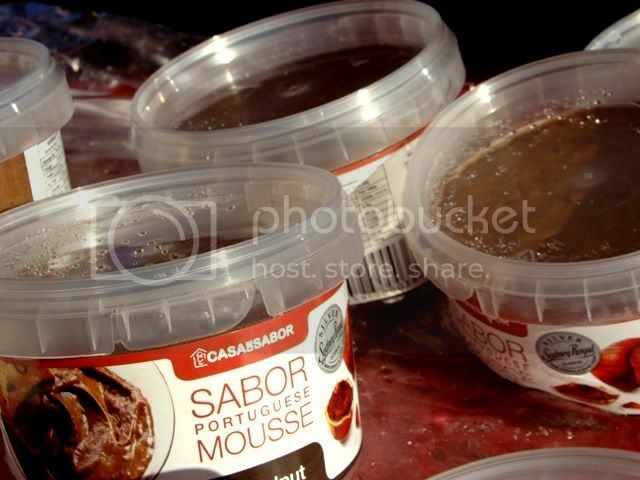 Erique's catchprase: "Aa! Onara suru tsumori datta kedo, unchi ga dechatta!" -> This band is AWESOME. They just rock the whole place. 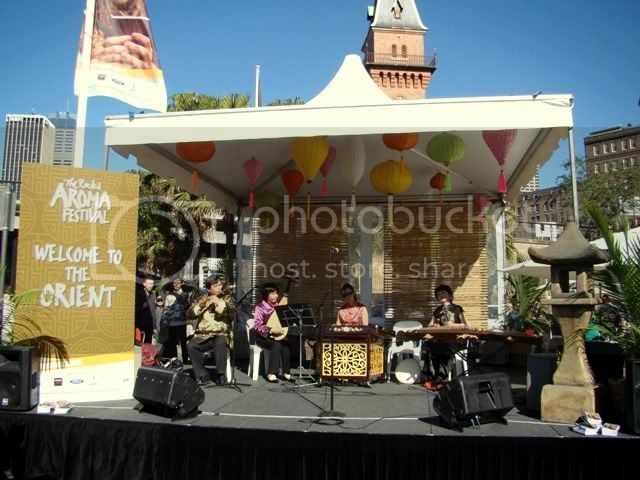 The one playing the Dizi (Chinese flute) is the ringleader of the band. Before playing each piece, he beautifully introduces the next music piece they're going to play along with a short history and origin of the particular song. He's just fantastic. 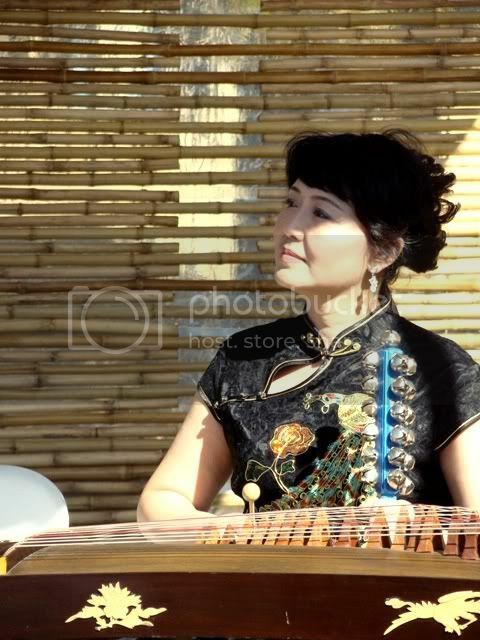 -> This Guzheng-plucking auntie is so pretty and mesmerizing. Totally my type. 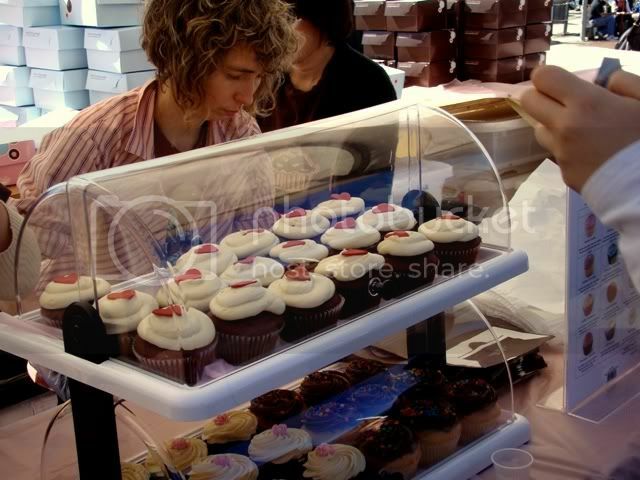 -> Yaay, more cupcakes. 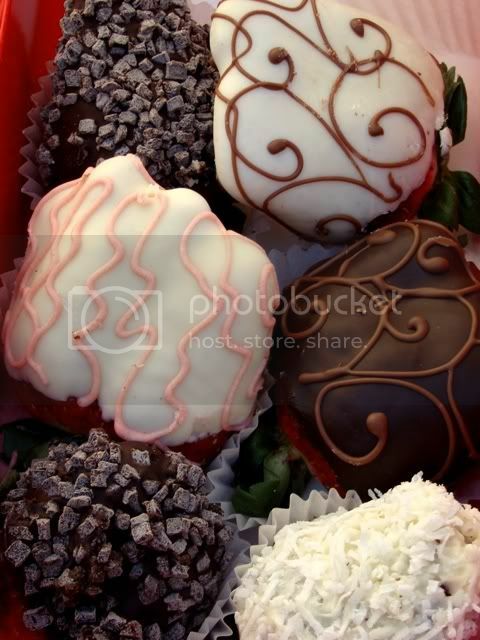 These ones are from The Cupcake Bakery. 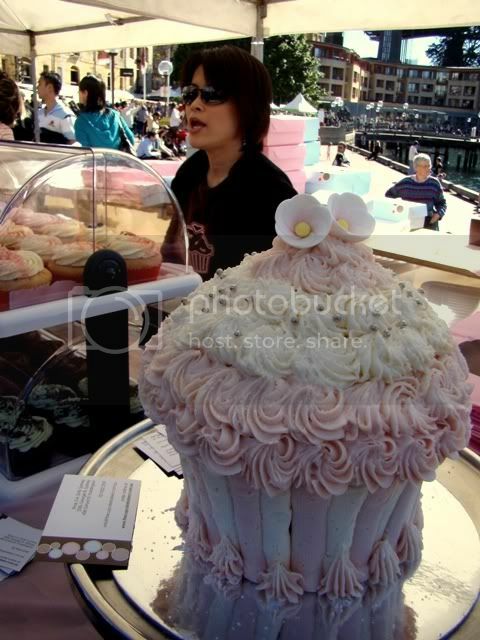 -> The Cupcake Bakery's piece de resistance - a gigantic frise poodle-like muffin that's not for sale *darn*!! 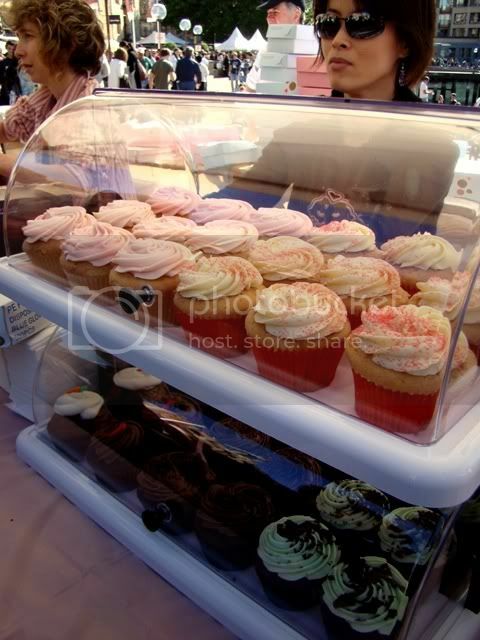 -> More cupcakes from The Cupcake Bakery. 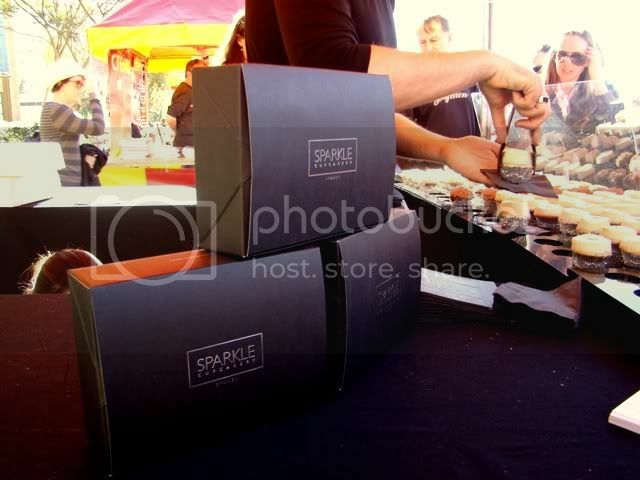 After looking at that fantabulous gigantic cupcake, these ones look so...muggle-born. 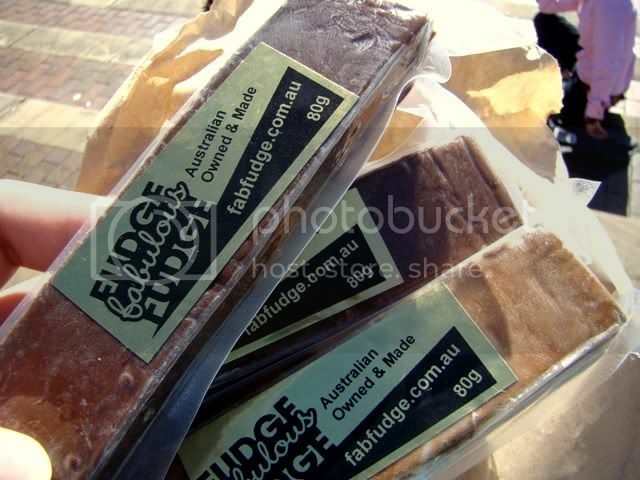 -> Impossibly breathtaking fudges from Fudge Fabulous Fudge. 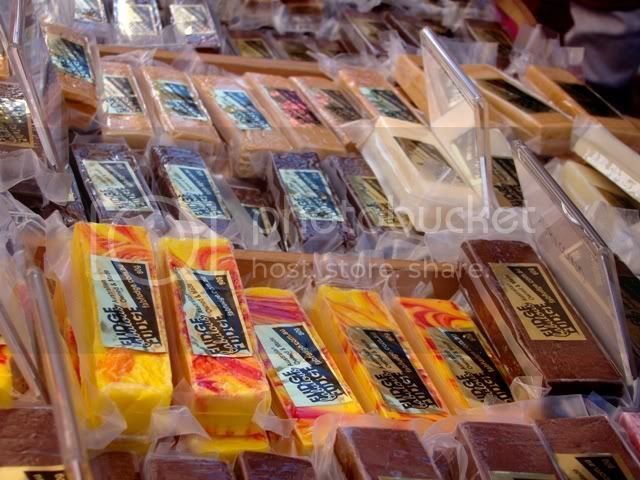 -> Bounty #2: Chocolate Macadamia, Rum & Raisin, and my personal favorite: Baileys Irish Cream fudge. BTW, I finished 2 of them on the way home. Damn, should've bought 10 instead. 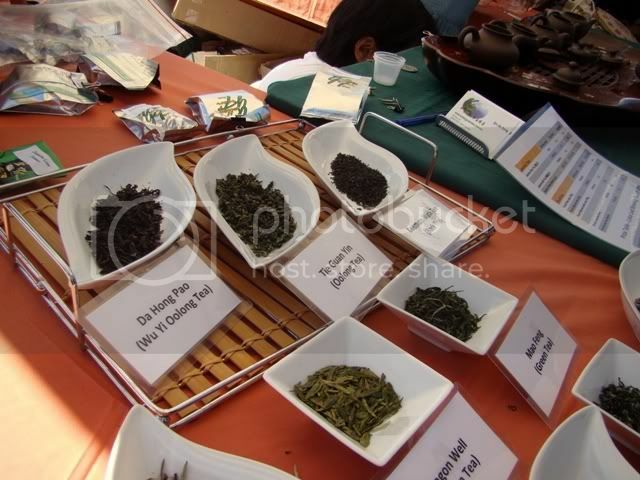 -> I want that tea set! I've always wanted a terracotta tea set - the ones that you can pour tea all over the tiny teapot itself and making it all wet. It looks sooooo good. Why do they do that anyway? What's the significance of that practice? Anyone? 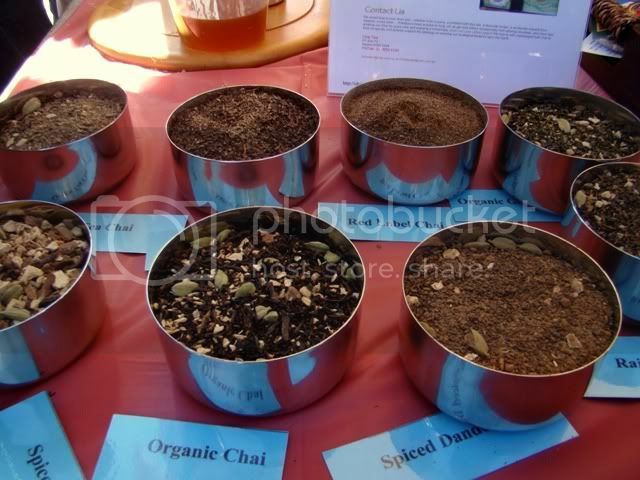 -> Chai tea from Chai. 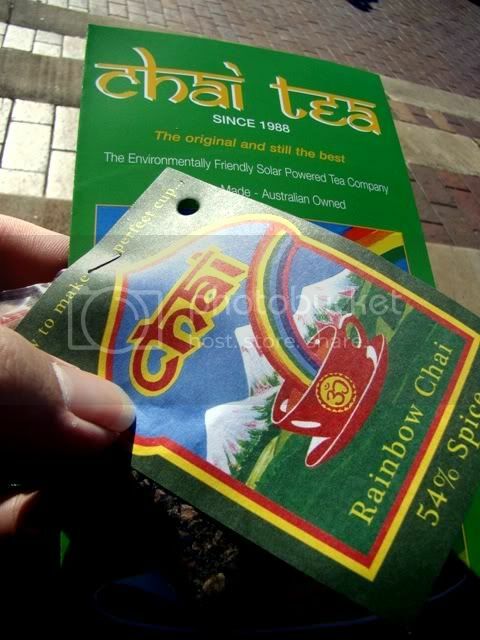 I'm kind of obsessed (again) with Chai recently. These days, I always seem to order Chai whenever I'm in a coffee shop (instead of coffee). I'm seriously afraid that I'm becoming a middle-aged hippie. 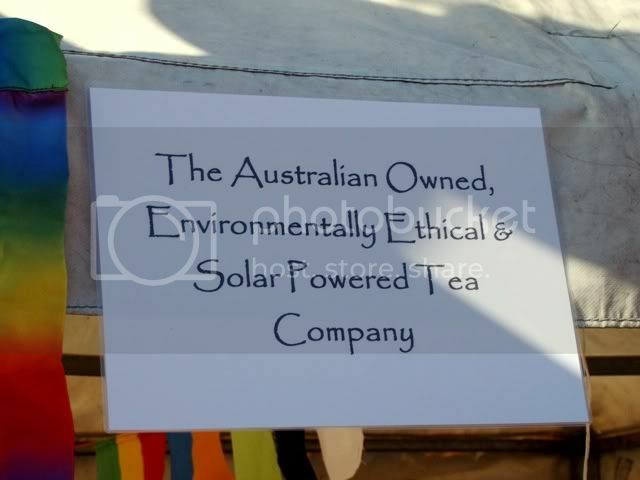 -> Australian-owned, environmentally ethical, AND solar powered? Wow, what more can you want? Truly a hippie company. 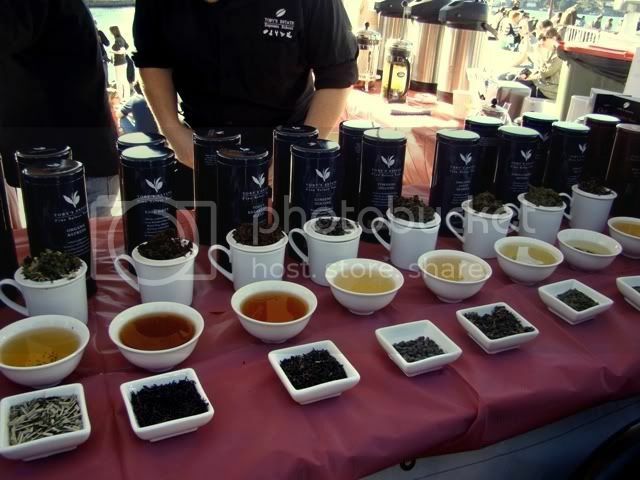 -> Another set of mouthwatering teas from Toby's Estate Fine Select Teas. They're a little stingy on samples, though. -> Damn expensive stuff, people. 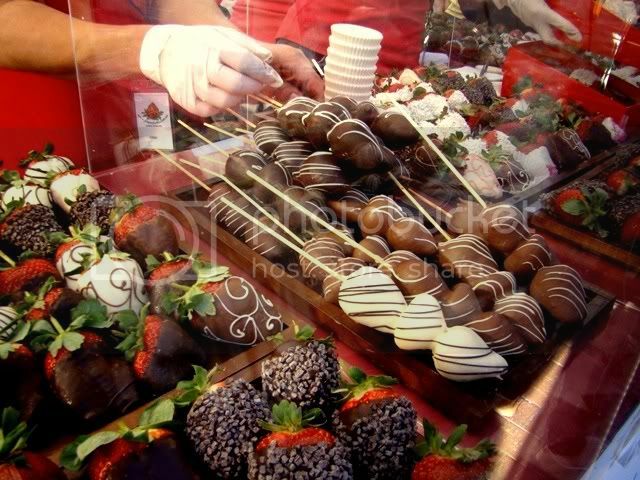 Those chocolate-covered strawberry skewers are like, 6 bucks each! Worth every penny, though. 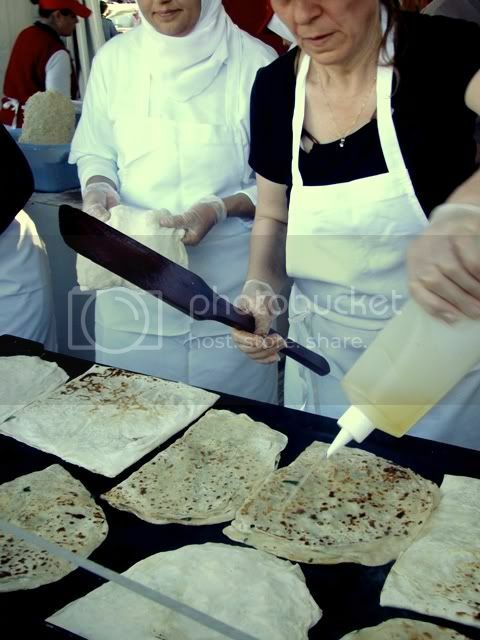 -> Definitely the most ooh-and-aah-ed food item in the whole festival. Wonder how much this one costs. 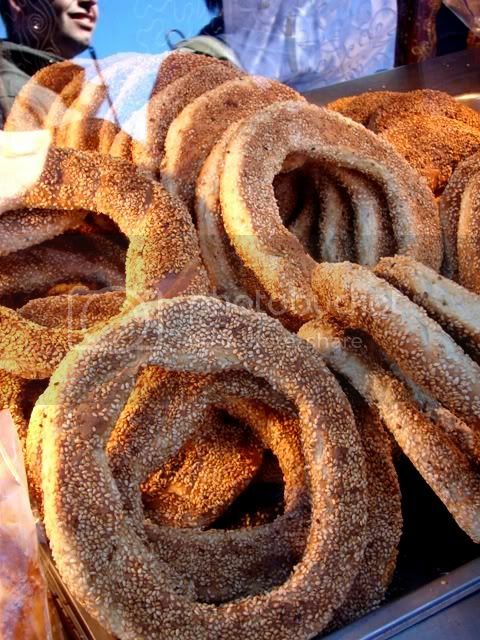 Erique's catchphrase: "Yemeğin salçalısı, kadının kalçalısı"
-> No idea what these are. I guess they're some kind of pudding. 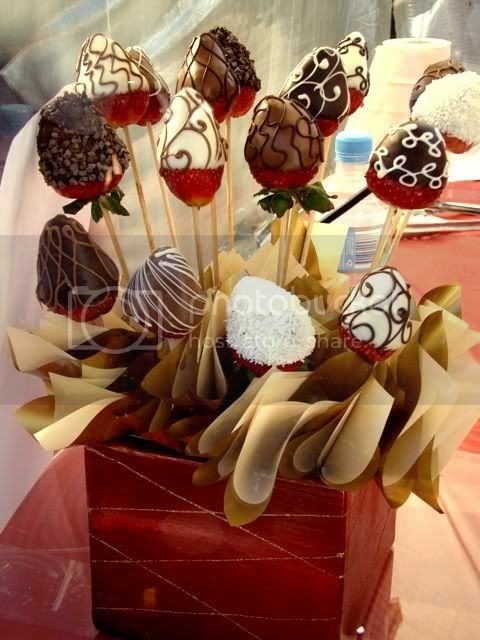 Anyway, it's from Gourmet Taste Buds. 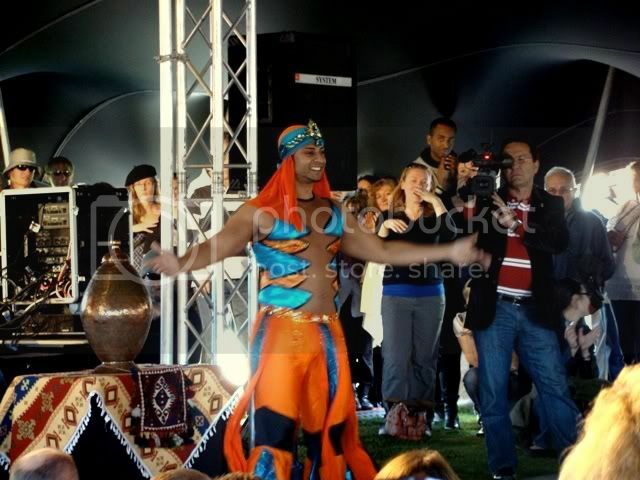 -> The entertainment on The Oasis district - male belly dancer. 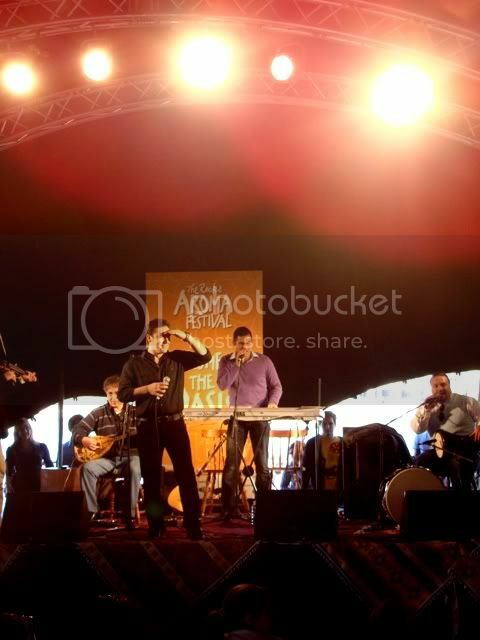 On close inspection, that is NOT Akmal Saleh, unfortunately. Gosh darnit. 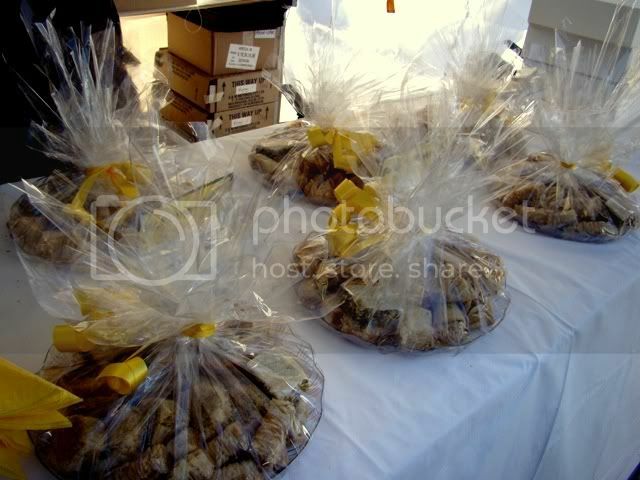 -> Probably the biggest temptation on the festival - sweet pastry drenched with sugar syrup that is the Baklava. Considering my family's long history with Diabetics, I need to resist this one - it is, after all, the mother of all sugary treats. 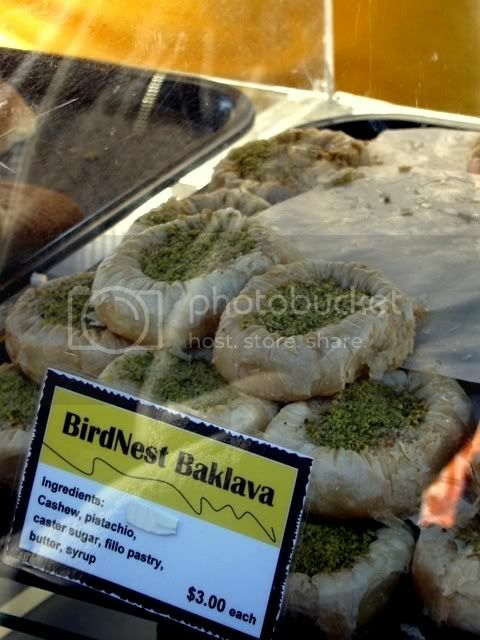 -> ...oh God...not the BIRDNEST Baklava... *EVIL*!!! 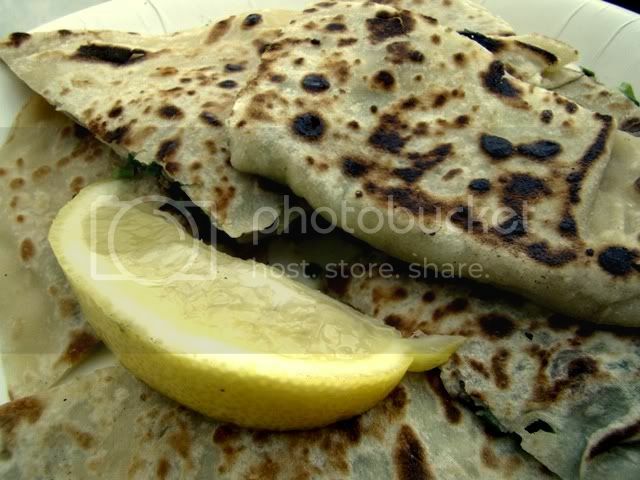 -> Last bounty of the day: Cheese, spinach & beef Gozleme. What can I say, I love all things Turkish. Not the prettiest food around, for sure - but it's so addictive and absolutely sumptuous. -> Definitely not something you see everyday. Phew! 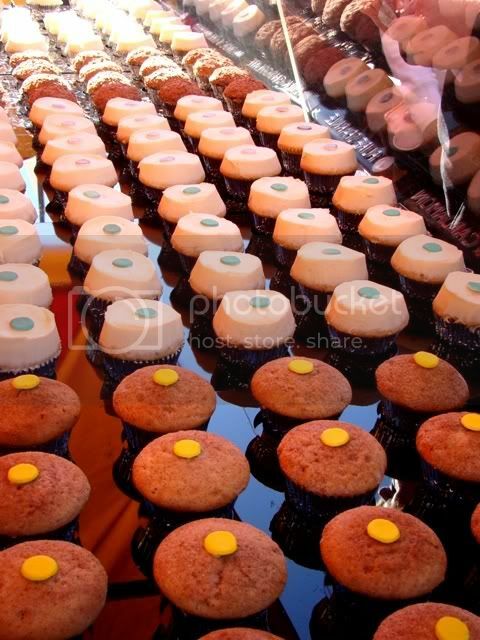 all those photo-captioning really made me hungry! 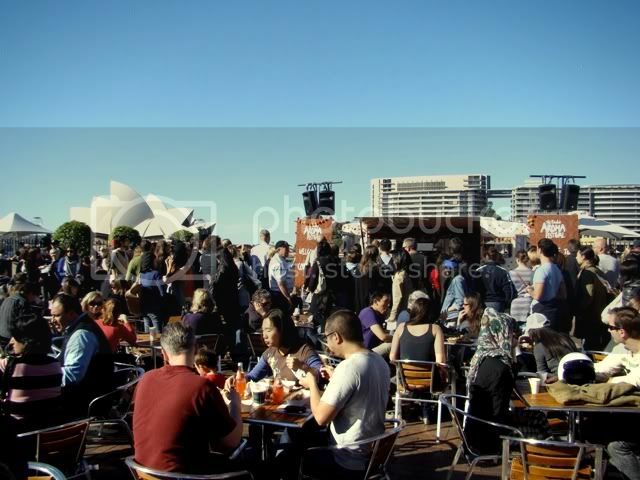 Okay, maybe one more crowd shot and I'm done, I promise! wow, looks like a much bigger and better event than i remember it from years ago. mona lisa coffee art very cool. Still obsessed over the man clutch ? Hahahahahahahah.... (Love ur paragraph about that !) 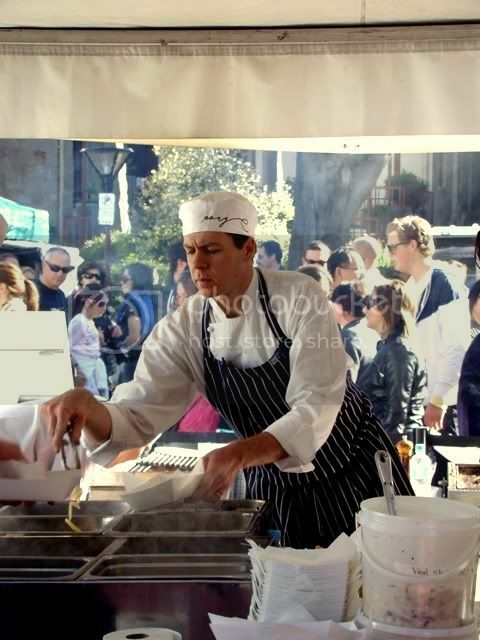 Geez, now I miss the food festivals... How come we don't have a decent food fest in Jakarta :( They have this Bango Food Fest, but my friend said they're running out of food before the 1st half of the event. 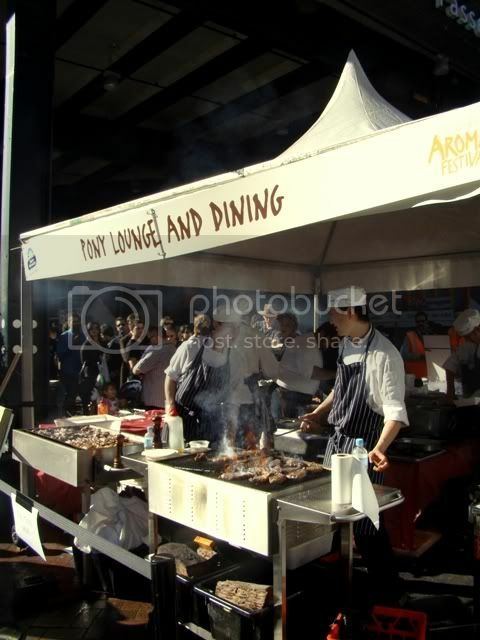 Yup, I know abt Bango food fest - probably the closest Jakarta has to a decent food festival. I heard you've got to get coupons because the stalls don't handle cash? Yes, yes, man-clutch. It's not going to be as small as a woman-clutch though. My rule of thumb is: It has to be able to fit a tiny folded umbrella, a compact camera, a wallet, a smaller pouch containing my emergency medicines, keys + phone. Anything smaller would not be acceptable. Most man-clutches out there are either too small (too ladylike), too unsuitable (more looking like a toiletry / travel case), or too big (more like a document case). It's really hard to find the right size. I've tried looking everywhere, including the ladies' section, LOL. There's this black Balenciaga clutch (the one that looks like the City bag but sans the handles) that MIGHT work but I've only seen the pics. I've got to see the real thing first, because it might look too feminine. There is another solution: go to Tokyo. LOL. They've got LOTS of cheap man-clutches (okay, maybe not so cheap, but certainly below $1000). BTW WHAT???????????? You mean the hakutou shigure??? They DISCONTINUED it??? Why?????? That's the only decent mochi they've got! 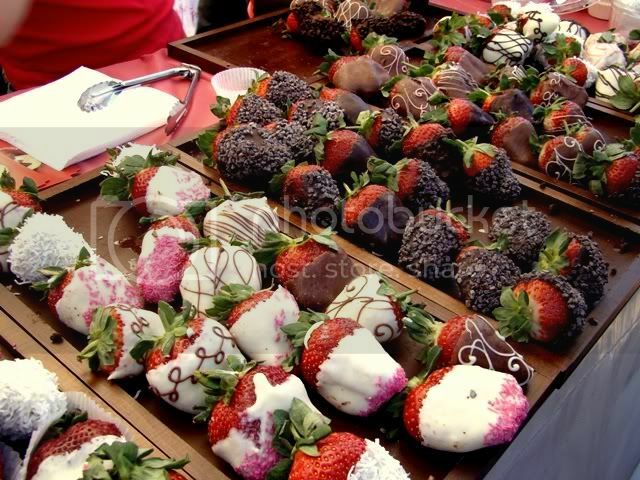 oh my goodness, those strawberries! And all that food. 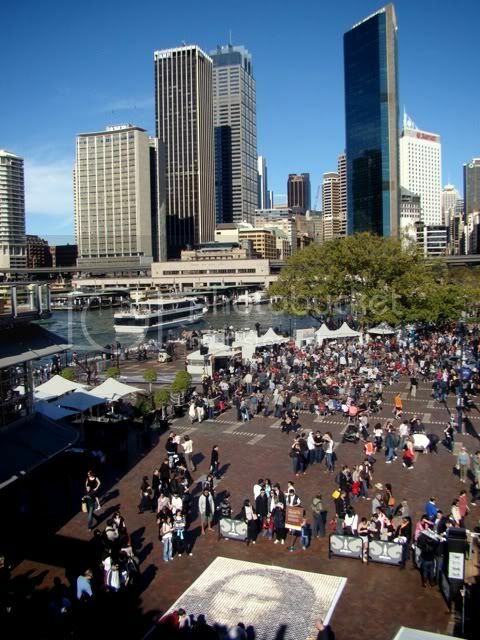 It's times like these I wish I lived in Sydney. I really enjoy to be here. 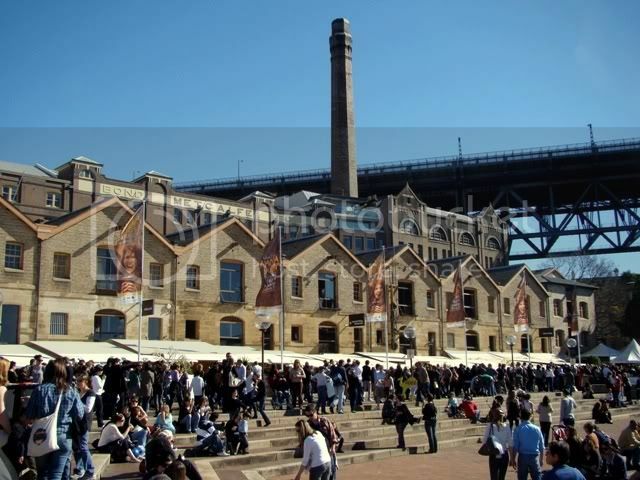 Your have great insight about The Rocks Aroma Festival 2009 - Sydney of your post. 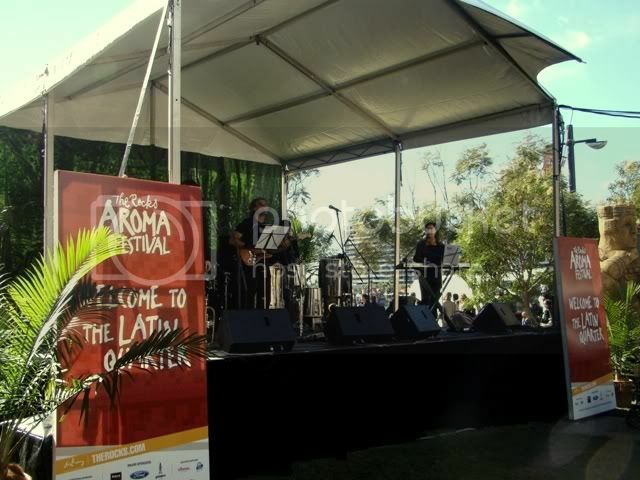 Your The Rocks Aroma Festival 2009 - Sydney blog is really excellent. 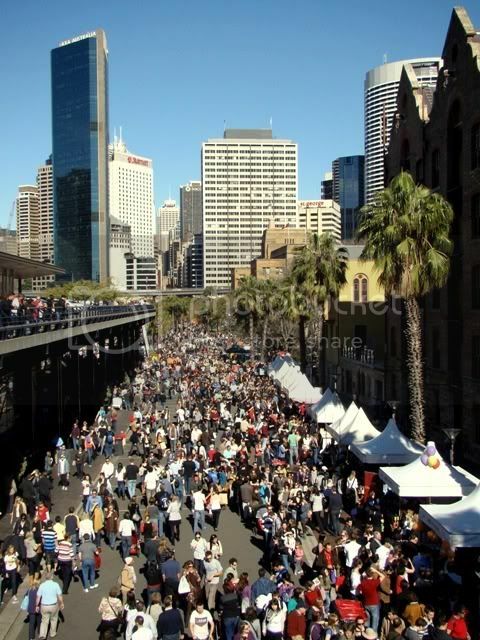 I am very much pleased with the contents you have mentioned.I wanted to thank you for this great The Rocks Aroma Festival 2009 - Sydney article. I enjoyed every little bit part of it and I will be waiting for the new updates. 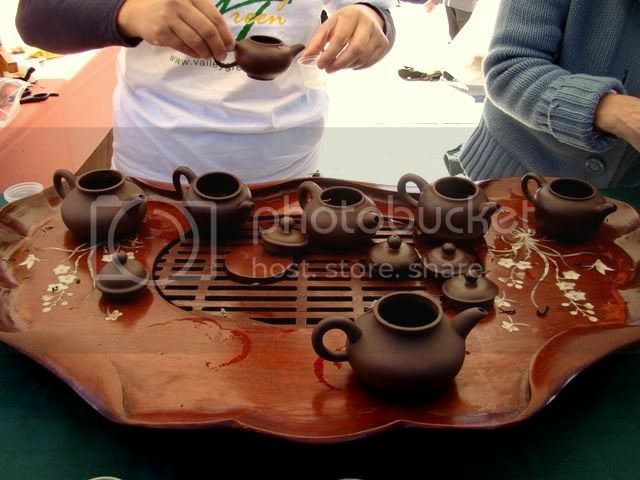 I think they pour tea over the teapots to keep the clay from drying out and cracking.